Michael, Summer and Michael talk about Desert Nights, Rising Stars Writers Conference at Arizona State University, where Mike Stackpole talked on panels again this year, and discuss the differences between literary and speculative writers, and their vastly differing approaches to writing novels, reading novels, and interpreting story. I almost wish I'd attended just to hear Orson Scott Card's talk. In any event, I feel a few arguments coming on. 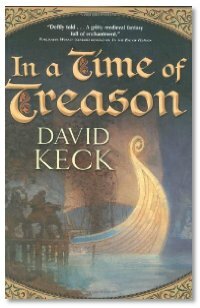 Interview: Mike M and Summer talk with David Keck about In A Time of Treason, the anticipated sequel to In the Eye of Heaven. Discussing the setting of faux-medieval fantasy, delving into the process of writing and publishing sequels, and writing despite the life that's happening around you, we chat about making stories where the world feels lived in, and the reader connects with both the smaller and the larger scopes of the story at the same time. * Why did you like the book? * What about the book will you remember a year from now? * Why do you want to recommend this book to other potential readers? If you can record it yourself and email it to Michael M, all the better! Re: "hit pieces" about sci fi. I've never understood why sc fi is hated so much, and an even bigger mystery is why those who like sci fi run afoul of the haters- like they're obligated to act smug and superior, or like it's a personal axe to grind with anyone who dares to be a sci fi fan. A podcast I listen to (not sci fi oriented) recently talked about high-functioning autism, and the "profile" of that condition just happened to cover "geeky behavior". So now we're sick because we like sci fi. The same podcast today gloated over the death of Gary Gygax, and harped on the whole "nerd' thing in regards to D&D. simon, anyone who gloats over the death of anyone else has many more problems then having a 'revenge of the nerds' type stigma in labeling people. The joke is kinda on them, scu-fi overwhelms mundane entertainment on a regular basis because of the emptiness of character in most popular entertainment. frankly, dont take it so personal. people who think outside the norms of any society are reacted to negatively. Your not sick, im not sick, we are part of the race that doesnt conform socially. We are as natural a part of the society as anyone else. Every tribe has a shaman.